A Bucks County man named as a person-of-interest in the case of 4 missing men has been rearrested on new charges less than 24 hours after making bail on a previous unrelated charge. 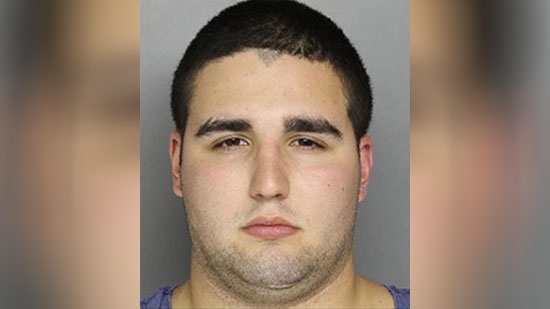 Bucks County District Attorney Matt Weintraub announced Wednesday afternoon that 20-year-old Cosmo DiNardo of Bensalem was arrested and charged with stealing the car of one of the missing men and trying to sell it. He was previously arrested on an unrelated firearms possession charge from February and posted 10% of $1 million bail. His new bail has been set at $5 million cash. He is accused of stealing a 1996 Nissan Maxima that belonged to 21-year-old Thomas Meo of Plumstead. The car was found in a garage on a property on Aquetong Road in Solebury Township owned by the DiNardo family. Inside the car, investigators found Meo's diabetic kit which he has to take with him everywhere. Weintraub also said they have a witness that says DiNardo tried to sell him the car for $500. Prosecutors argued that DiNardo was a flight risk and a danger to others when requesting the high bail. His parent's released a statement today through their lawyer, "As parents, Mr. and Mrs. DiNardo sympathize with the parents and families of the missing young men and they are cooperating in every way possible with the investigation being conducted by law enforcement." UPDATE: Bucks County District Attorney Matt Weintraub announced that they have recovered human remains on the farm property they have been searching located on Upper Mountain Road in Solebury Township. The remains were discovered at the bottom of a 12 1/2 foot ditch dug up by police. Weintraub also announced that they have positively identified the remains of one of the missing men, 19-year-old Dean Finocchiaro of Middletown Twp. There are other human remains that were found in the mass grave that have not yet been identified. Weintraub is now calling this case a homicide.